He met his wife Sunita during their Civil Services Training in Mussoorie, Uttarakhand. He is a pure vegetarian man and follows Vipassana. He has also worked with Mother Teresa. In 2006, Arvind Kejriwal was awarded Ramon Magsaysay Award for playing a very useful hand to enact RTI Act. According to his close aides, he is very rigid, determined and stubborn to his decisions. cleared Civil Services exam in a single attempt. 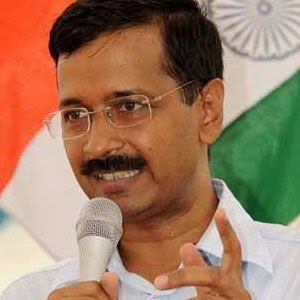 defeated former 3 term Delhi CM Sheila Dixit by 25,864 votes in Delhi Assembly Election, 2013.
main member of the team who made Jan Lokpal Bill. Kejriwal led AAP to win 67 of the 70 constituencies in the 2015 Delhi Assembly elections, leaving the BJP with three seats and the INC with none. To make Delhi the first corruption free state in India. He stands to his words and make India 100% corruption free. 2009: Awarded a grant and fellowship by the Association for India's Development. 2014: Kejriwal was featured in Time's 2014 Time 100 list of the most influential people in the world. Arvind Kejriwal had said in a rally, Take "bribes" from BJP and Congress but to vote for AAP in the upcoming Delhi Assembly election. "You can't afford to hate politics. The politics of this country is democracy. Democracy is by the people, of the people and for the people. The day people stop taking active part in the politics of this country, democracy will not survive."